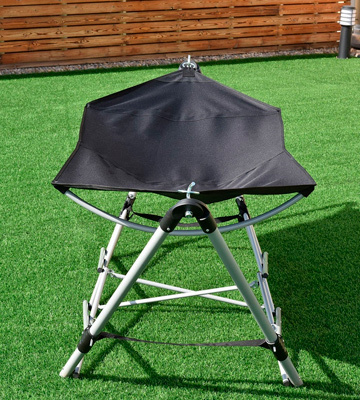 Under the hammock, you can find a capacious storage net for your personal belongings. 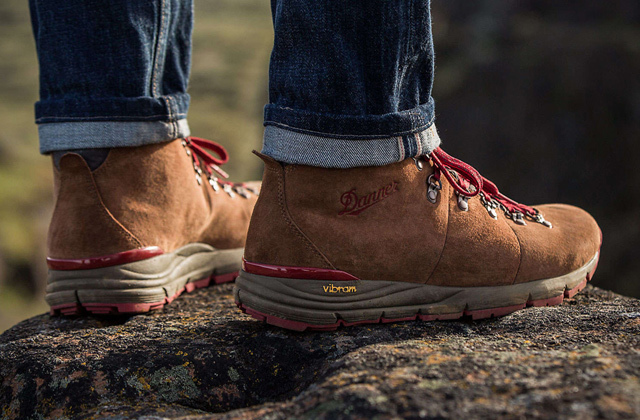 Massive feet guarantee stability on any surface, including sand and ground. The assembly process may be rather cumbersome. This model stands out thanks to 2 attachment points on the frame. It is especially important in terms of safety because it completely excludes the risk of tipping. The hammock fastens to the frame with the massive steel chains, thereby the max load can go up to 300 lbs. Also, such a feature makes this model the most wear-resistant. Hard to fit the frame and the hammock into a storage pouch. Sturdiness, practicality, and spaciousness are the best words to describe this hammock from Kamp-Rite. Because of the large dimensions of the bed, lying in it is super pleasant, so it will become your favorite place to chill. Folding and unfolding this hammock will take you seconds, you definitely won't have any trouble with this process. The storage bag is complete with shoulder straps for easy carrying. Some users point out the low quality of stitching. Do you want to create a cozy resting place in your backyard, but ordinary lounge chairs seem tough and uncomfy? 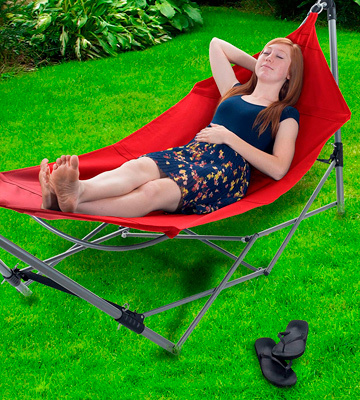 Then this portable hammock will become a great alternative, besides you don't need any trees to place it. The hammock is made of robust oxford fabric, thus the chance of breaking and abrasion is minimal. Also, this material is easy to maintain since you can put it into a washing machine and dryer. Flipping over in it is easy: you need to be careful when lying down. 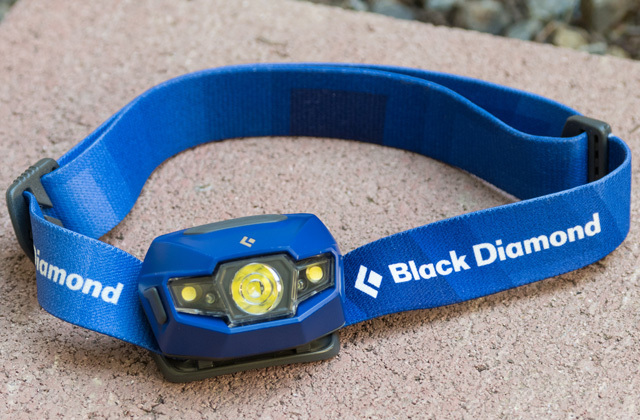 Thanks to the small weight of just 19 pounds and small dimensions when folded, this model is best for long journeys. Besides, the durable steel frame will bear a load of up to 265 lbs. 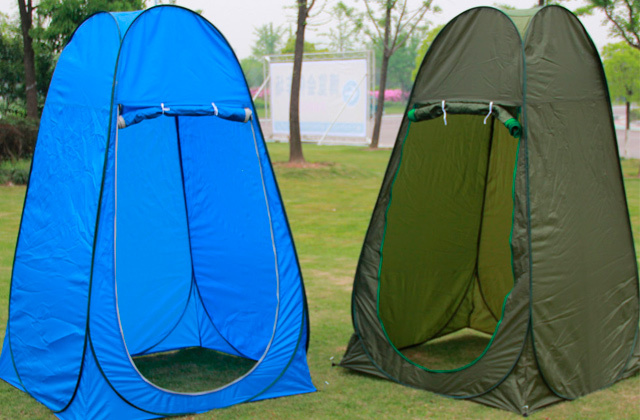 The construction includes 4 safety pins that prevent accidental folding while you are in it. 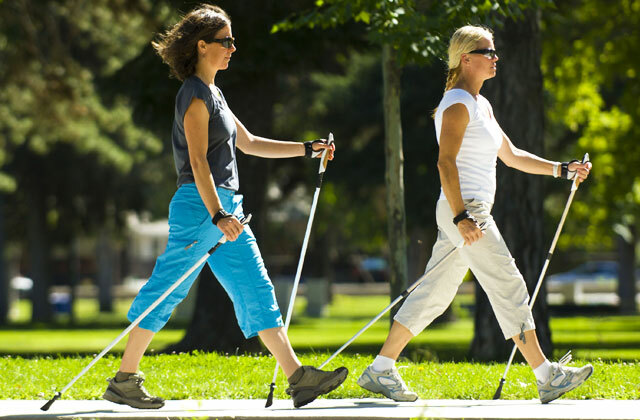 And 2 extended leg stabilizers allow putting it on uneven surfaces. Compared to the other models, it is not that compact when folded. 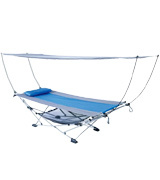 If you are looking for an inexpensive yet reliable hammock, which can create a comfortable place for rest and sleep, choose this stylish model. What is more, with its help you can make an extra sleeping place for your guests. 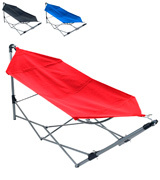 The Mac Sports Portable Fold Up Hammock boasts a nice design and convenient construction. 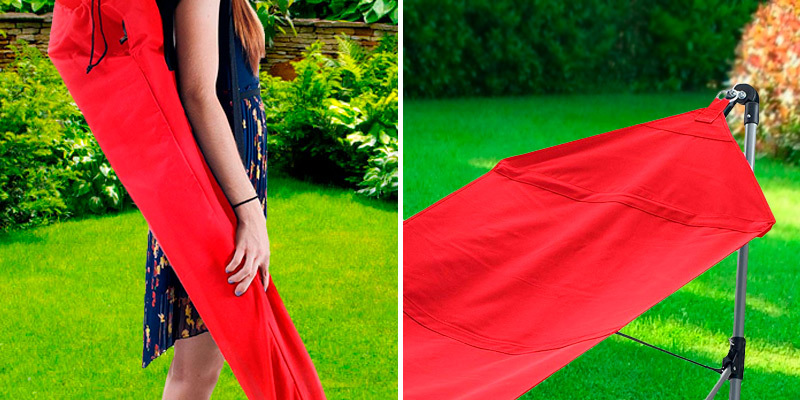 First things first, it features a removable canopy, which will save you from the hot sun. It is attached to the telescopic poles. They can be easily pushed back when the canopy is not in use. To add more convenience, the hammock has a mesh net underneath, which can be of great use for storing small personal belongings. Also, for more enjoyable rest, this model comes with a removable pillow. 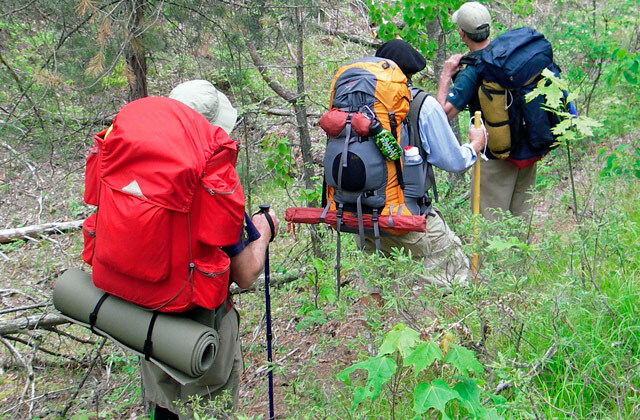 Thanks to that, it is a perfect option for your camp when you go on a hike. You don’t have to take any extra stuff for having a comfortable rest: the hammock comes fitted with everything you need. As for the construction, this portable piece of furniture stands out thanks to 2 attachment points on the frame. It is especially important in terms of safety because it completely excludes the risk of tipping. Massive feet guarantee stability on any type of surface, including sand and ground. The hammock itself is made of polyester and the framework is made of steel, giving it a pretty average weight of 34 lbs. 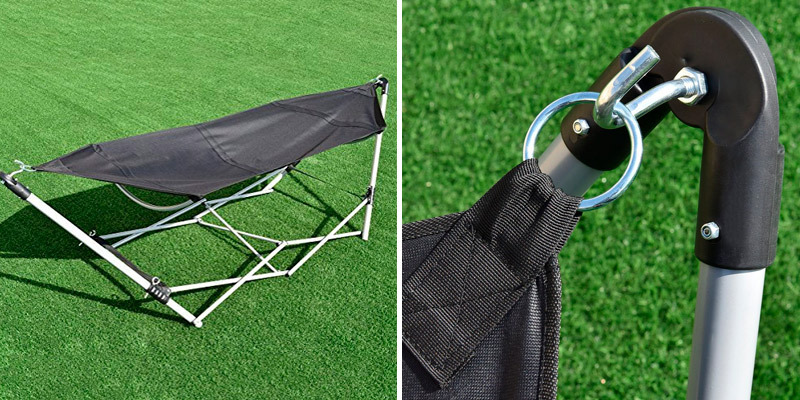 So, the Mac Sports Portable Fold Up Hammock is a well-thought-out piece with a number of convenient details to make your rest outdoors as comfortable as possible. If you want to have a nap or lie and read a book in your yard, but you have no trees situated close enough to hang a hammock, here is a great choice for you. The Kamp Rite Kwik Set is a folding hammock that supports itself thanks to the robust steel framework. 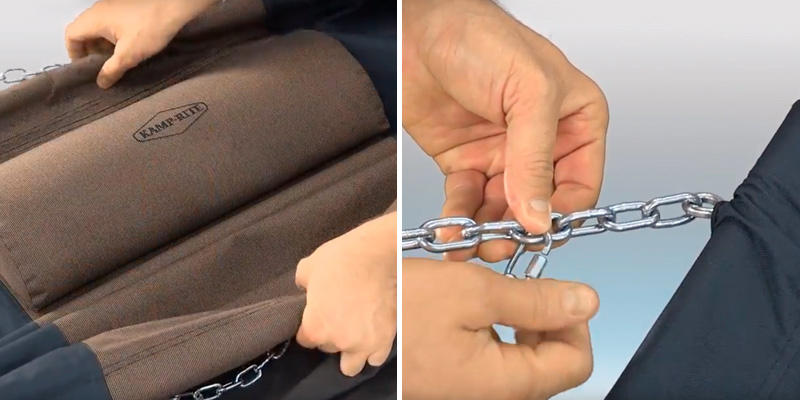 The hammock fastens to the frame with massive steel chains, thereby the max load can go up to 300 lbs. Also, such a feature makes this model the most wear-resistant. The bed is pretty spacious (102″L x 38″W x 35.5″H). It also features a removable pillow, that’s why lying in it is super pleasant, so it will become your favorite place to chill. You can choose the most comfortable position and have no fear of falling. As the name states, this hammock is indeed quick to set up. 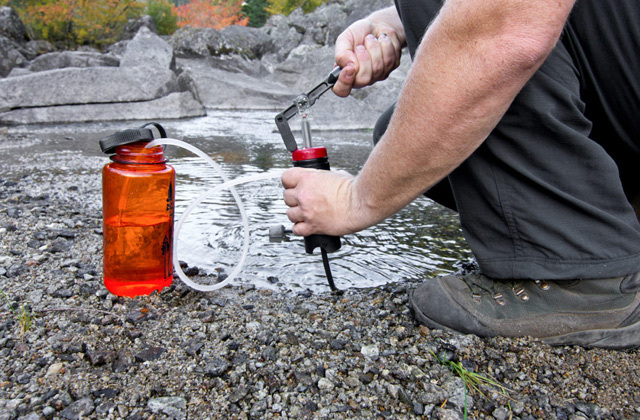 It will become a great addition to your camping adventure. It features non-skid feet, so you can place it even in a tent when you go travel (just remember you may need a big one for this hammock). 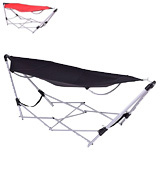 The hammock is not only easy to set up but also to disassemble. What might be hard is to fit the frame into a storage pouch, so bear in mind this process may take you a while. Sturdiness, practicality, and spaciousness are the best words to describe this hammock from Kamp-Rite. This large foldable unit will let you rest with comfort wherever you go. The Pure Garden portable hammock is the best model for carrying with you. To begin with, this model has a steel collapsible construction. Folding and unfolding this hammock will take you seconds, you definitely won't have any trouble with this process. This model also features a convenient storage bag, which comes complete with shoulder straps for easy carrying. 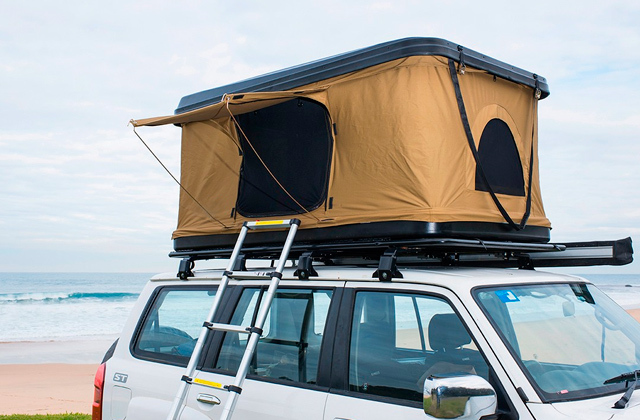 It is also spacious enough to fit the hammock with no extra hassle. What is also great about this item is that it's pretty lightweight. Despite decent dimensions, this hammock is only around 21 lbs. The bed is made of canvas and comes in three color options: red, blue and black. It is durable yet soft and makes lying in it nice and comfortable. It also doesn't hold moisture, so even if you leave it under the rain, it won’t damage the canvas. You can just shake it off and let it dry completely for a little bit. However, some users point out that the quality of stitching could be better. That’s why we recommend being careful in use and when cleaning it in order not to damage the bed. If you want to create a cozy resting place wherever you go, then this portable hammock from Pure Garden is a great choice. It is convenient to carry around and you don't need any trees to place it. With the Giantex portable hammock, you can comfortably lie and enjoy the nature anywhere at anytime. The unit will surprise you with its durability and sturdiness. To begin with, the bed of the hammock is made of robust oxford fabric, thus the chance of breaking and abrasion is minimal. Also, this material is easy to maintain since you can put it into a washing machine and dryer. You can choose between classic black and bright red colors. Thanks to the small weight of just 19 pounds and small dimensions of it when folded, this model is best for long journeys. Besides, the durable steel frame will bear a decent load of 265 lbs. The framework contains only a few parts that need to be assembled. However, we wish that it were more sustainable. Thus, you have to be extra careful when getting on and off the hammock in order to avoid tipping over. 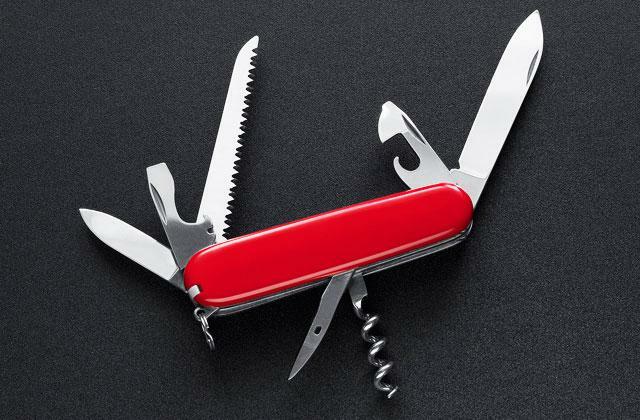 When not in use, it folds down to a compact size. You can keep the hammock in the carry bag that comes with convenient straps. Other than that, the Giantex portable folding hammock has no construction flaws. It pleases its user with its robustness and will serve you for a long time. 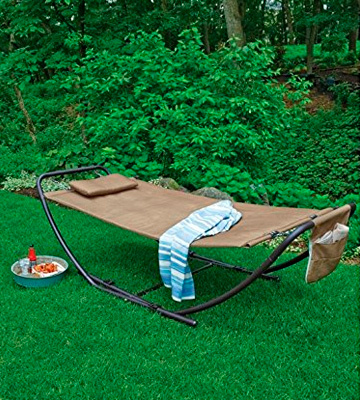 Purchase this item and you won’t have to lie on the hard ground and uncomfortable loungers ever again. 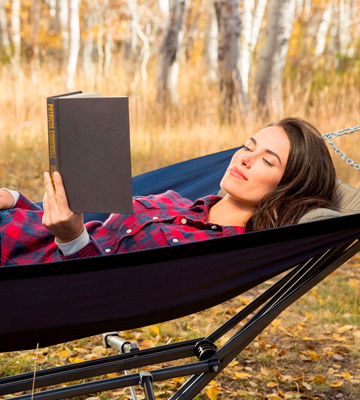 As the name suggests, the Backyard Classics is a portable folding hammock that will suit for home use. If you want to relax on your patio with comfort, this model will be quite suitable for you. Despite its simplistic design and comparatively affordable price, this item isn’t weak. It has an average size and can support a load of up to 250 lbs. The unit comes with a metal frame that can be folded in two when not in use. 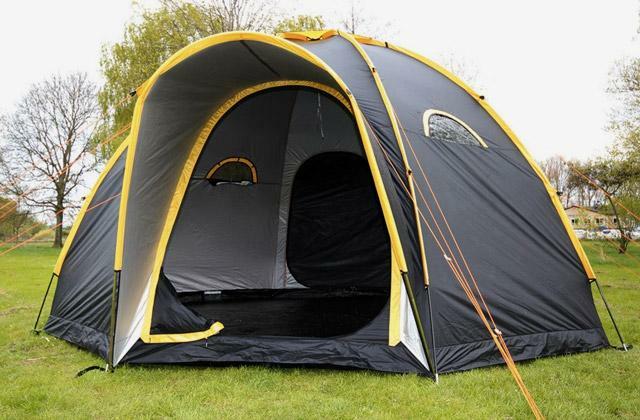 It may not be as compact as its counterparts, yet still, it will save you much space in your backyard. This model has a pretty heavy weight (35.7 lbs), that why it will work best for those who don’t plan to carry the hammock around very often. This model can also become a real lifesaver if you have guests coming over and need an extra sleeping place. It will be as comfortable as a real bed. 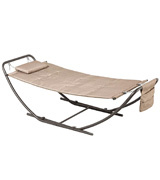 To add convenience, the manufacturer equipped this hammock with a removable pillow. The heavy-duty frame is made of powder-coated steel. 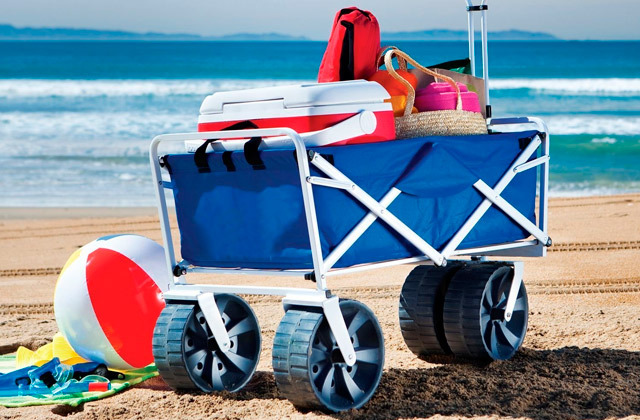 It has non-skid feet so the unit will stand securely on any ground. 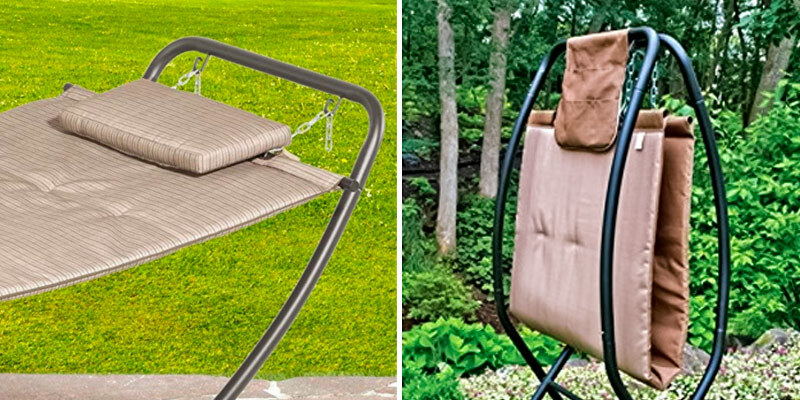 If you are looking for an inexpensive yet reliable hammock, which can create a comfortable place for rest and sleep, this stylish model from Backyard Classics is the best portable folding hammock for your patio. Add it to your backyard and rest while enjoying nature. 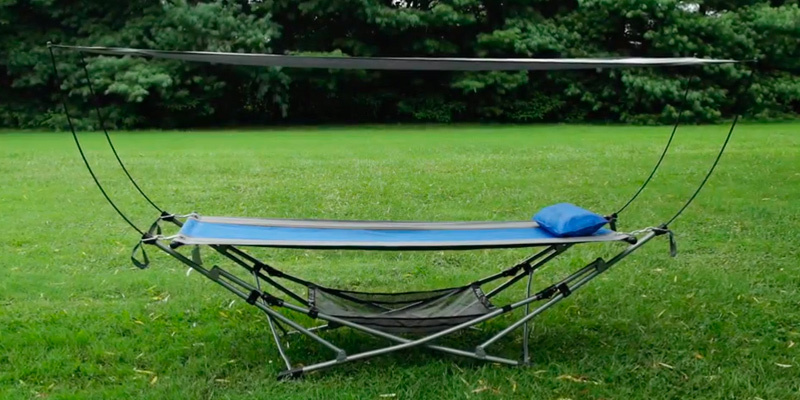 What Is a Portable Folding Hammock? Lying in your backyard under the warm sun with a glass of your favorite drink is one of the best ways to get some rest. 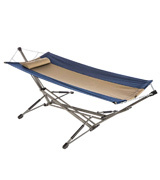 If you don’t enjoy rigid lawn chairs or small armchairs, both of which are unsuitable for lying down, a portable folding hammock may become a good choice for you. With such a piece of furniture, you can relax wherever you want. A portable hammock doesn’t need to be tied to a tree since it has its own sustainable frame which is easy to set up. This frame is usually made of steel or aluminum. You can move it around your yard and hide in a shadow, or, conversely, always stay in the sun and get a nice tan. These hammocks are also very convenient in terms of storage. They can be easily folded and put in a storage bag. Despite the metal frame, most of the models are also relatively light. 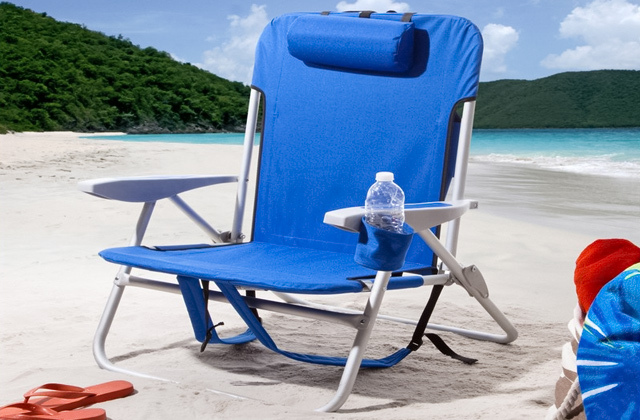 Due to this, you can take such a hammock with you when you go on a hike or to the beach. 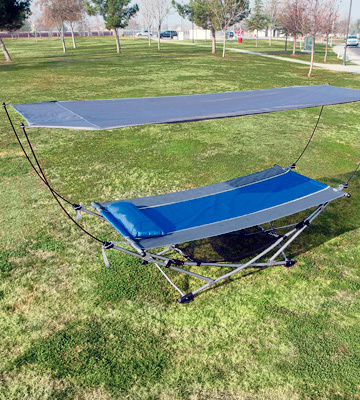 Apart from that, portable folding hammocks don't differ much from their suspended counterparts. The bed can be made from various materials. The hammocks also can be single or double. 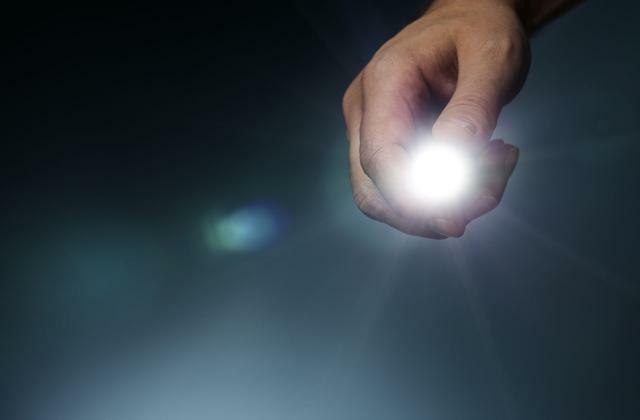 When buying one, you need to decide if you are looking for a space-saving light model or a big capacious item. So, if you are looking for the best folding hammock, we have 5 great models for you to choose from. And to make your lounging even more enjoyable, we recommend purchasing one of these patio umbrellas as well.